Big Fuzzies are a large species of Fuzzies that first appeared in New Super Mario Bros. Wii. They move on rails and can be defeated in all the same ways as a normal Fuzzy. 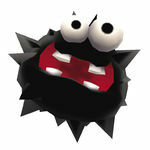 They are the only new enemies in New Super Mario Bros. Wii to return in New Super Mario Bros. 2. Big Fuzzies made their debut in New Super Mario Bros. Wii. In the game, they appear in World 7-3, World 9-5 and World 9-8 along with their smaller counterparts. They are relatively the same as normal Fuzzies. Big Fuzzies reappear in New Super Mario Bros. 2, having the same role in its predecessor, and appearing in World 4-C. In New Super Mario Bros. U, Big Fuzzies appear in Spine-Tingling Spine Coaster, acting as they do in previous games. Big Fuzzies appear in the minigame Fuzzy Fliers in Mario Party 10. In Super Mario Party, some Big Fuzzies appear as obstacles alongside regular Fuzzies in the minigame Fuzzy Flight School. ↑ Shogakukan. 2015. Super Mario Bros. Hyakka: Nintendo Kōshiki Guidebook, pages 145, 195, 210. This page was last edited on January 12, 2019, at 12:54.